We wish you Season’s Greetings with a repost of Michael telling the story of how Rudolph the Red-nosed Reindeer came to be in 1939. 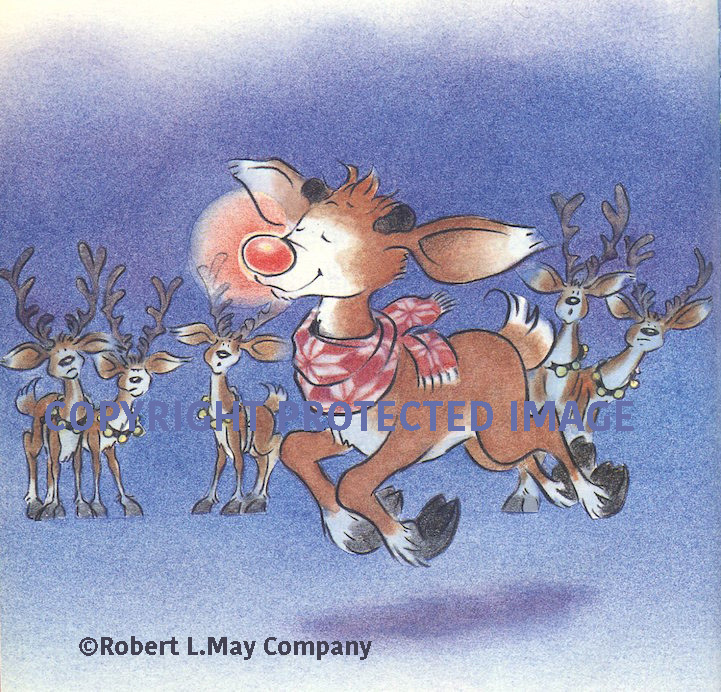 Michael has a personal connection with the little reindeer – he illustrated the official version in 1994. Bob fidgeted in his oak office chair. He glanced up from his typewriter at the clock on the wall. 3PM. Two more hours and he could leave. The holidays had just come and gone, but the usual joyous event had been celebrated under a cloud. The papers that year were full of bad news. A massive war looked likely again in Europe. Germany’s new fascist leader Adolf Hitler had just announced in parliament his plan to exterminate all European Jews. Bob and his wife Evelyn were both Jewish. Germany would soon march its rebuilt army through Vienna, Prague and then into Poland, killing thousands of people on its way. Russia had invaded Finland, Franco’s Fascists had taken over the government in Spain. Britain was arming for war. America was watching nervously. 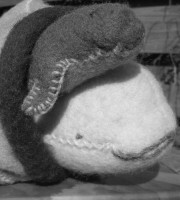 Bob wanted to get a something nice for his wife, who was terribly ill with cancer. It was snowing outside on the streets of Chicago, but working for Montgomery Ward, one of the biggest department stores in the city, he could shop by taking the stairs up to the ladies department without going outside. Bob glanced at the clock again. 4PM. One more hour. He hit two keys at once and his typewriter jammed. He cursed just as a bell rang and he was called to the phone. He crossed the room, wiping deep blue ink from his fingers as best he could before he picking up the inter office line. Bob glanced at the clock again – 4:45. It was already dark outside, the holiday lights still up, blazing in the store windows, gathering crowds of post-holiday shoppers. But deep in the basement offices of the advertising department of Montgomery Ward department store, there were no windows. Just the glow of a green desk lamp. Slumped at his desk, Bob aimlessly sharpened a pencil with his pocket knife. How was he supposed to work on something happy for kids with all the madness going on in the world? He tried to focus. Other young Jewish American artists at that time, also engrossed by the horrors unfolding across Europe, were creating new kinds of superheros – comics artist Bob Kane and writer Bill Finger created Batman the same year, writer Jerry Siegel and artist Joe Shuster created Superman just the year before. But Bob would invent his own, quieter character. Small, persecuted, an outsider – one of Santa’s reindeer. A little deer with a big nose – an all too common antisemitic caricature of the time. Rudolph. Rudy the Red-nose. Bob began to type, typed some more. The nose became the key to the story. Soon the clock showed 2AM. But he’d done it. He had his hero. It’s impossible to know the exact genesis of any creative idea. But some facts are clear, Rudolph the Red-Nosed Reindeer was undoubtedly born on a dark day in January, 1939, in the mind of Robert L. May, at a small desk in the advertising department of the Montgomery Ward store in Chicago, amid very personal, unimaginable grief and inescapable daily accounts of inhuman global turmoil, cruelty and suffering. Sadly, before the work was completed, Robert L May’s wife Evelyn died. Robert was told he needn’t finish the project but he chose to work through his grief, eventually completing it in August of that year. The rhyming poem was an instant hit. 2.4 million copies were given away during Christmas 1939. The hopeful tale of a plucky little deer with the big red nose was just the antidote to the gloom of world events. The little book slept during the war because of paper shortages. Then after the war, another 3.5 million were printed. In 1946 Robert asked his boss if he could have the rights to Rudolph. In an act of unusual generosity, his boss agreed. A few years later, Bob’s brother-in-law, a struggling songwriter named Johnny Marks, proposed writing a song about Rudolph. He was convinced it would boost Rudolph’s name around the world. He was right. The song was indeed a hit, becoming the best-selling record in America for over 30 years. The May and Marks families have been caretakers of Rudolph ever since – almost 80 years. The two families need to agree on most projects, deciding what is best for the famous little deer, who is practically part of the family. I personally became involved in Rudolph’s world when a local Boston area publisher, specializing in quality reproductions of historical literature, Applewood Books, contacted me to illustrate a second, less known and never fully illustrated story about Rudolph, titled Rudolph’s Second Christmas. They had already reprinted an exclusive edition of the first book with the original illustrations by Montgomery Ward staff artist Denver Gillen, with great success. I met Robert May’s daughter, who at the time was managing the family Rudolph business. She told me 99% of her job involved chasing bootleggers who were using Rudolph’s image to make illegal t-shirts, coffee cups and toys. Many of the Rudolph toys you see are actually black market contraband. 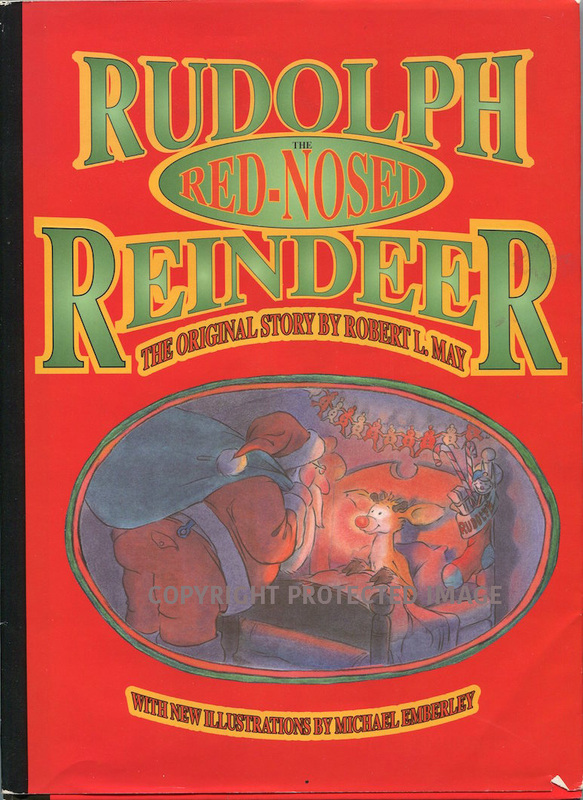 I agreed to illustrate the book, and its success led to a second book project, a new edition of the original story, Rudolph, The Red-nosed Reindeer. It was published in 1994. No, I didn’t get rich. I was paid a one-off fee. You never own anything relating to a licensed character. I’ll never see the art again but I knew this before I started. I’ll never suggest I suffered the mental turmoil Robert did, but somehow it seemed fitting that the color work on the first book was completed with my drawing-hand in a cast (due to an untimely broken wrist), with the help of a good friend -a skilled artist- and a lot of painkillers. It was a rewarding experience overall, illustrating such an iconic character of American children’s literature. I grew up watching the beloved TV version. Too bad I didn’t get a chance to draw my favorite character from that animated version – one Robert L. May never imagined Rudolph would meet – the abominable snowman. All illustrations by Michael Emberley © Robert L. May Company. Strictly copyright protected.